I traveled from Germany to New Mexico 25 years ago on a tourist visa. The Land of Enchantment enchanted me so much that I never left again, which means I run most of my races in the wide open spaces of the Southwestern US, where I feel at home geographically. On a cultural level, there are still times when I don’t feel like an American. I find the rules of baseball mysterious, and the taste of hot dogs appalling. Open displays of nationalism still make me uneasy, except during the soccer world cup. 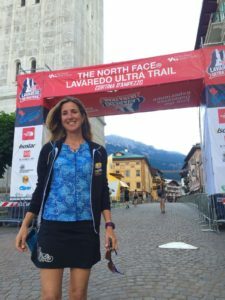 But last week, I finally ran a race in Europe – not just any race, but the Lavaredo, a 119 km long ultra in the most scenic part of the Italian alps. The 1300 participants come from over 60 different countries, but the vast majority of them are European. I realized then and there that, as a trail runner, I am not as European as I thought. Instead, I look, dress, and fuel like a true American. Like the general European population, European ultra runners tend to be be a sleek, fashion-conscious crowd. Rugged, weather-beaten mountain types in baggy t-shirts, untidy pony tails, or scruffy beards are in the minority. Instead, trail runners tend a) to be well groomed and b) to wear color-coordinated outfits made from very tight, very bright spandex. I quickly learned that vibrant hues are gender-neutral. Early in the race, before I adjusted my goal from placing among the top twenty in the women’s field to surviving the day more or less in one piece, it was not always easy to tell whether runners ahead of me or behind me were male or female because seeing someone wearing red or purple pants from a distance did not give useful clues. European runners not only dress more fashionably, they’re also more openly proud to be runners. They don’t just wear their running shoes everywhere. They wear their entire color-coordinated running outfits, spandex and all, when they are not running or about to go running, like days before the race, while having dinner, while walking around the expo, while exploring the town of Cortina. Of course, their outfits look snazzy to begin with, so why not? On the other hand, some European runners are so excited about their upcoming race that they pin their bib onto their snug spandex top as soon as it is in their possession and walk around wearing it all day, which seems like overkill to me. The unique combination of spandex outfits and nicotine also took some getting used to. When I lived in Germany and Italy, all my friends smoked. When I moved to the US, airplanes crossing the Atlantic still had smoking sections in the back, where Europeans gathered under a blue cloud of toxic fumes. I would love to say that, more than twenty years later, the stereotype of Europeans still smoking cigarettes no longer applies. There are fewer smokers than there used to be, it’s true. But when we cheered on runners of the Cortina Sky Race 20k on Thursday, a fair number of them lit up a cigarette right after crossing the finish line. “Fit smoker” is not an oxymoron in Europe. Still, it’s better than to be an unfit smoker. Ultra runners everywhere need to eat and drink, but what they consume depends on where in the world they happen to be. 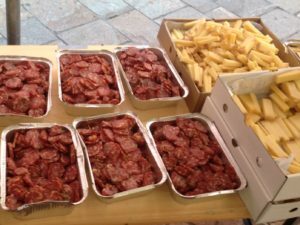 The Lavaredo aid stations were well stocked, but their offerings gravitates more to the sweet side than in the US: Nutella sandwiches, fruit, cookies, pastries, and bowls of sugar cubes. No potato chips, no crackers, no pretzels, no boiled potatoes. Savory snacks consisted of noodle soup, bread, cheese, salami, and, at the very last aid station, hard-boiled eggs. Desperate for something salty, I finally tried the cheese. Now I’m a convert. Bite-size bits of Emmenthaler should be standard aid station fare everywhere. Drink choices consisted of tea, coke, and a concoction called isotonic, a popular sports drink among European runners, but, from what I had read before the race, toxic for everyone else, kind of like root beer is for non-Americans. Speaking of beer: large quantities of the real kind appeared at couple of unofficial aid stations late in the race. Everyone chugged at least a cup of it, except for me. I stuck with coke, my ultra rocket fuel. Like drinks all over Europe, it was served at room temperature, which is normally just how I like it. For the last twenty-five years, I have ordered my ice tea without ice at US restaurants, but in the heat of the day on the Lavaredo course, I longed for cold drinks like a true American. The amount of stuff US ultras send home with their finishers says, I think, something about the rampant materialism of US consumer culture. Runners go home with awards like medals, plaques, or bracelets, in addition to coffee cups, bottle openers, hoodies, and jackets. Not so at the Lavaredo, where the schwag consisted of a t-shirt in the goodie bag from the expo and a paper-thin,vest-like garment with the race logo at the finish line. There are no medals. There are no buckles. There’s also an obvious upside to this kind of frugality: US ultras tend to cost a small fortune to enter, while the fee for the Lavaredo is a reasonable 110 Euros. While the Lavaredo RDs do not spend a cent more than necessary on awards, they do invest money where it counts, i.e race organization and safety. The aid stations are few because of the remoteness of the area, but they are overflowing with food, drinks, cheerful volunteers, and medical support. Medical vehicles also wait at the bottom of every major downhill, which seems like a wise precaution. In addition, race officials roam the course with walkie-talkies, making sure no one goes missing. Some of the more haphazardly run US races could take note of this. Race management also splurges on adding drama to the race. 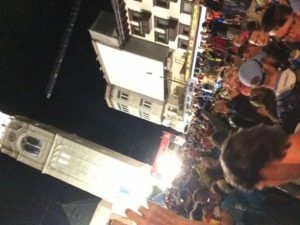 The 11 pm start on the cobble-stoned street next to the medieval bell tower in downtown Cortina makes it feel more like a gala party than a trail run. Starting in the early afternoon, a team of professional announcers provides non-stop commentary in a non-stop fever pitch over huge loudspeakers. In the evening, the people of Cortina pour out of their houses to line the street. Ten minutes to show time, music by Ennio Morricone stirs up emotions, even tears. Then the countdown, tre, due, uno, and we’re off, a sea of multi-colored spandex pouring down the Corso Italia, like champagne bubbles out of a bottle, accompanied by a concert of cheers, claps, and shouts of Forza! Forza! Many hours later, at the finish, everyone who has made it once again feels like a superstar. Names sound grandiose over the speaker system. Announcers and crowds still have enthusiasm to spare. I am much more used to Ultras about a tenth the size of the Lavaredo, staged at campgrounds or tribal parks, where the start consists of a casual wave instead of a formal ceremony. I am used to crossing a finish line on a dirt track in the middle of nowhere, where the scruffy individuals who have already finished sit around drinking beer, and every half-hour or so clap half-heartedly for two seconds when someone else arrives. 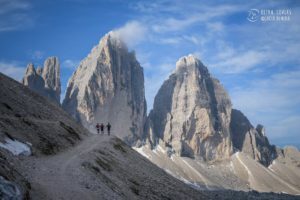 It’s hard to say which type of race I enjoy more: the dramatic flair of the Lavaredo or the easygoing nonchalance of grassroots events I frequent in and around New Mexico. I love them both. And once we’re off and running, none of their differences matter much. 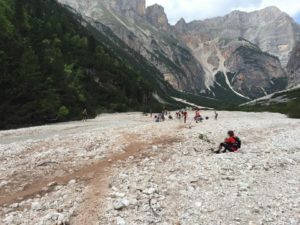 After the electric start of the Lavaredo, the cheers die down at the edge of Cortina, where the cool darkness of the mountains swallows us and trail racing becomes the quiet, introspective sport it is everywhere else. The muddy conditions soon color everyone’s race outfit, spandex or not, a uniform beige. The spectacular beauty of the Dolomites instills the same sense of awe in runners from Turkey, Canada, and Iceland. Grunts of pain sound the same in any language. Trail running is a global passion that transcends language barriers and national borders. We all share the joy of reaching the top of a mountain, the heartbreak of a DNF, the agony of walking down stairs the day after. Our families and friends all over the world think we’re crazy. We all like it that way. Underneath the tight spandex tops or the baggy T-shirts, our hearts beat to the rhythm of the same drum. No matter where we’re from, we have found a sport that brings us joy, and we have found each other. Life does not get better than that. It is a good time to be alive and running – everywhere. This entry was posted in Uncategorized on July 7, 2016 by silvakat. It was fun to read this from someone else’s perspective! I was born in Asia, grew up in the US, but spent 2 years recently in CH. I ran a handful of races there and to me the differences were stark. The sizes of the races and crowds were something else. Lots of single track trails meant lots of time just running behind others, making it hard to settle into a rhythm. I love the laid back, small races here. Of course, that doesn’t mean I won’t go back for another run in the Alps. And the cheese! Hello Duke, thank you for commenting! Yes, the crowds took some getting used to, especially with everyone (except for me) using trekking poles. I also love the smaller races, but every so often, it is fun to have a different experience. And cheese! Always enjoy your adventures. Good luck at Imogene. Gracias, juez! I hope to see you at Imogene! Beautifully written, Silvakat. You tie it all together in a way that speaks to the heart! Thank you, Carolyn – my name is Katrin, by the way.